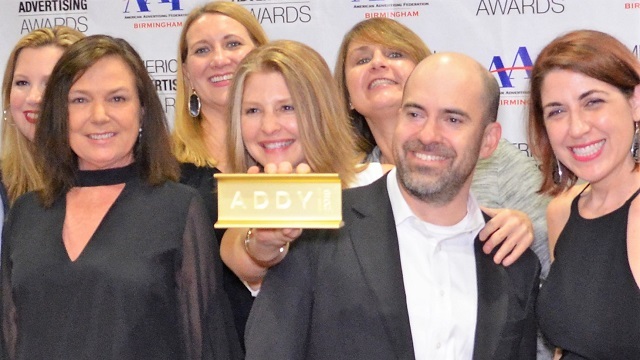 Advertising ranging from the space program to frogs and stretching to Puerto Rico and South Carolina took home ADDY awards from the American Advertising Federation Birmingham Chapter on Feb. 22. AAF Birmingham held its annual ADDY awards ceremony at the Haven on Birmingham’s Southside. Birmingham ADDYs recognize best of Magic City advertising firms from Alabama NewsCenter on Vimeo. “Best of Show” went to Intermark Group for its expansive “This is Alabama” campaign for the Alabama Tourism Department. The campaign went to great lengths (and heights) to bring a spectacular feel and view of the Alabama Gulf Coast to people in downtown Chicago. Alabama Tourism Department brings Gulf Coast parasailing to downtown Chicago from Alabama NewsCenter on Vimeo. “Best of Show Broadcast” to Lewis Communications for its MUSC Health campaign in South Carolina. “Creative Director of the Year” to Stephen Curry of Lewis Communications. “Art Director of the Year” to Spencer Till of Lewis Communications. “Copywriter of the Year” to Joel Lugar of Intermark Group. “Designer of the Year” to Roy Burns III of Lewis Communications. “Photographer of the Year” to Jeff Williams of Lewis Communications. “Judges’ Special Award” to FitzMartin for its “Hope Changes Everything” ad for Big Oak Ranch. “Best of Show Student” to Tyra Robinson of UAB for her “Unforgotten” series. Bill Stoeffhaas of Style Advertising was presented with the Silver Medal Lifetime Achievement Award. Big Oak Ranch “Hope Changes Everything” commercial from Alabama NewsCenter on Vimeo. Dozens of other gold and silver ADDYs went to those agencies and others including Alabama Power, Luckie, Telegraph Creative, UAB University Relations, Brand Neue Company, Big Communications, FRED, Infomedia, Burton Advertising, Stephen DeVries Photo, Six Foot Five, Ali Clark, Outpost Pictures, Boutwell Studios, City Paper Company, Cummings Creative Group, Out There Creative, UAB, Flex, Scout Branding Company, Knight Eady, Red Clay Media, CrowneWorks Creative Media, High Noon Media Services and Encompass Health. Alabama Power’s commercial titled “Frogs” was used to communicate the company’s environmental stewardship efforts. Alabama Power “Frogs” commercial from Alabama NewsCenter on Vimeo. Lewis Communications’ ViequesLove campaign was aimed at drawing tourists back to Puerto Rico after Hurricane Maria decimated the island in 2017. ViequesLove’s “Beaches” commercial from Alabama NewsCenter on Vimeo. Other ADDYs awarded work for Good People Brewing Co. beer can designs (Lewis Communications), a Cedric Burnside album cover (BIG Communications), a St. Paul & the Broken Bones music video (BIG Communications) and UAB football (Burton Advertising).